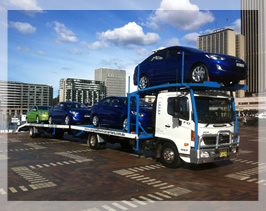 Campbelltown City Car Carriers maintains a modern, reliable and highly advanced fleet of vehicles ranging from two-car (2) to eleven-car (11) carriers. Operating various vehicle-carrying configurations allows us to cater for both single-vehicle and bulk-vehicle movements in an efficient, timely and professional manner. Our equipment is meticulously maintained, regularly modified and/or upgraded to ensure that we are capable of transporting all makes and vehicle models of any age, both securely and damage free. 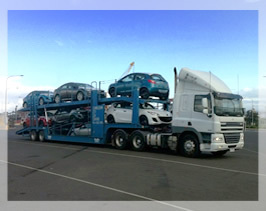 Modernising our fleet, is our guarantee to you, our valued customers that we can accommodate your vehicle transport requirements now, and in the future. Whilst in our care, all vehicles are fully insured and are secured on our carriers using wheel straps. Wheel straps, as opposed to chains, ensure the undercarriage of your vehicles are not compromised in transit. Certificates of Currencies for all transport-related insurances can be supplied upon request. Offering daily services within the Sydney Metropolitan, Illawarra, Central Coast and Newcastle areas, we aim to provide a 24-hour vehicle delivery service dependent on your vehicles location. 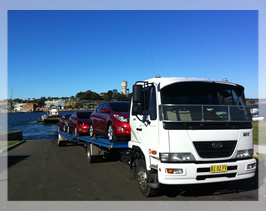 Regular services of the NSW South Coast, Southern Highlands and other surrounding areas are also provided which ensures that your vehicle is delivered to you on time and without further delays. We can also manage your interstate and intrastate deliveries utilising our preferred and trusted industry carriers. Utilising an industry-devised and customised transport program, we can provide you with accurate and estimated delivery times at the time of booking and can track your vehicle from pick-up through delivery instantly. Our system ensures that you, the customer are kept informed of any delays and allows us to maintain your vehicle booking at all times until delivered. We understand that prompt delivery and superior customer service are essential within this industry and it is our aim to provide this premium service to our valued customers. Our Company and its staff hold appropriate accreditation to enter wharves within Australia for the collection of new vehicles and the import/export of used private vehicles. For an obligation free quote, please contact us on (02) 9822 4955 or via our online Contact Us form.